It seems that Microsoft has been toying with Surface Pro prototypes that use Qualcomm processors rather than Intel, hinting that this could be a potential future for these tablets – or at least the lower-end models. 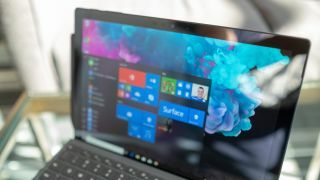 This comes from Brad Sams over at Thurrott.com, who observed that there are prototype Qualcomm-powered Surface Pro devices “floating around”, and that Microsoft has “considered replacing the low-end Pro devices with Snapdragon chips but so far, has yet to ship any products that do so for various reasons”. One of the major stumbling blocks is likely to be that Snapdragon chips aren’t powerful enough to deliver the sort of performance users want – particularly when software emulation issues are thrown into the mix, when using x86 apps – and more to the point, the performance that Microsoft would want to offer in its Pro 2-in-1s. Could Surface Pen replace your mouse? Is Surface Pro 6 a worthwhile upgrade? The first crop of so-called ‘always connected’ ARM-powered PCs were criticized for sluggish overall performance levels, with the Snapdragon 835 not giving the machines nearly enough oomph, and the succeeding Snapdragon 850 was similarly seen as rather a performance flop. However, we now have Qualcomm’s Snapdragon 8cx chip on the horizon, which we recently saw that Lenovo is making a laptop with, and despite not hearing much else about that, we can but hope this will finally really push forward and impress in terms of getting a smoothly running portable where the previous Snapdragon solutions have failed. So maybe it won’t be so long before Microsoft has a powerful enough Qualcomm engine to build a base model Surface Pro around, with early prototyping work setting the backdrop. After all, it does make sense that Microsoft would want to push always connected PCs by showing off one of its high-profile hybrids running Windows 10 on ARM (with some beefy battery life to boot, hopefully, which is one area we haven’t been so impressed with when it comes to our Surface Pro 6). We also have to bear in mind that the rumor mill (also Thurrott.com) has it that Microsoft wanted to debut an ARM chip in the Surface Go, but was persuaded by Intel to go with Pentium instead (although the aforementioned performance concerns doubtless played their part in that decision, as well). And that obviously raises the prospect that the sequel to the Surface Go might run with a more powerful Qualcomm processor, if the Surface Pro doesn’t take the baton, perhaps. Whatever happens with the next Surface Pro, one thing we can definitely expect is USB Type-C support, which really should have been delivered in the Surface Pro 6, in all honesty.